Managers can agree that employee engagement and retention are at the top of their priority list. Every company wants to attract and keep the best talent. Many employees in today’s job market quickly feel uninspired by their work, get bored after 2 years and start job hunting for something new. All these numbers point to the same basic conclusion: employee turnover is expensive. Outside of financial burdens, employee turnover puts a ceiling on the quality of a team or individual’s work. The reason? Companies with high turnover have fewer employees with a high degree of institutional knowledge. If most employees leave a company after just a few years, then the company never benefits from that golden combination of skills, talent, and critical institutional knowledge that helps business thrive. So we decided to speak with some of the best HR professionals and business leaders around the country to find the strategies and employee engagement best practices that they recommend. There are also some tips below that have been really successful for our company. Free bonus: Download this entire list as a PDF. Easily save it on your computer for quick reference or print it for future company meetings. Includes 5 bonus ideas not found in this post. SnackNation CEO Sean Kelly recently gave a presentation at the HR Star Conference, a large gathering of human resources professionals. The presentation, titled “Millennials in The Workplace”, discussed how organizations can increase engagement with their millennial employees. One of the key points Sean discussed was how important it is to align your company with an overall purpose. Don’t focus on what you do, but why you do it. As millennials quickly begin to dominate the workforce, this message becomes more and more important. 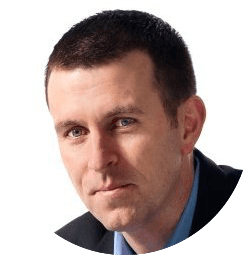 Kevin Sheridan, New York Times best-selling Author of Building a Magnetic Culture, has helped some of the world’s largest corporations improve their culture and foster productive engagement. Want to know a great way to get your team more involved and committed? Keep them up to date with “inside” information. These are things like the direction of the company and the challenges that the Leadership Team is facing. If someone on your team hits their monthly or quarterly goal, make it a win for your department or the whole company. Announce it to the rest of the team and celebrate with a Friday Happy Hour or fun outing. Work-life balance often seems like an impossible struggle. It’s difficult to find that right balance between work and personal life to feel good that both areas are receiving enough attention. Work-life balance is going to mean something different for each employee, so speak with your team to see what you can be doing better as an organization to enhance it. Often times you’ll find that a flexible work schedule will be the easiest way to help people feel more balanced between work and leisure. It shouldn’t only be left to managers to praise good work. When you hear about someone’s achievement, go over and personally congratulate them. It’ll mean a lot to that person and they’ll likely do the same for you when your big wins come through. To shake up the workday, or start Monday off with some inspiration, Cooleaf recommends hiring a motivational speaker to come into the office. Maybe your team would benefit from a creativity workshop or team-building seminar to improve in-office relationships. Employees will be grateful for the opportunity to grow and learn from experts and will come out of these experiences more energized and focused. Take a half day Friday to do something fun together. Go on a scavenger hunt, play sports outdoors, go paintballing or bowling. These social events help people bond with others on the team who they don’t interact with on a daily basis and builds a better sense of community within your organization. 1. Personal, professional development and a structure for growth, recognition and are alive in the organization. 2. Managers, mentors and trainers that are equipped to coach, inspire and bring out the best in their people. 3. Communities of purpose; groups that are centered around a purpose driven business, CSR or community activity are alive, aligning shared values and mission with collaboration. 4. Transparency of communication and the integrity of the organizations commitment to growth, recognition and the optimization of individual and collective potential is mirrored in new ways of developing team spirit and vertical/horizontal collaboration. Sometimes it’s a lot easier for employees to say how they really feel in an anonymous survey. Actually, it’s always easier when it’s anonymous. 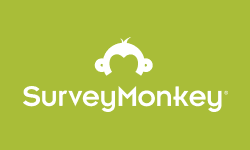 Use a tool like Culture Amp, TINYpulse or SurveyMonkey to create a survey and send it out to your team. Surveys are one of the few ways to actually measure and track engagement, so definitely make this part of your efforts. How are you feeling? What’s the morale you see around you? How satisfied are you with your opportunities for professional growth? Do you have a good working relationship with your manager? Are you satisfied with your overall compensation? Are they into mountain biking? Do they write a personal blog? Do they want to backpack around Southeast Asia next summer? Know what your team is passionate about. It’ll help you connect with them and show them that you actually care about their interests. Frequently ask teammates about their passions and even try to find ways to integrate their interests into the workplace. For example, if someone does the job of an accountant by day but harbors a passion for art by night, then suggest that he or she shadows someone in the Art Department for a day. If an employee loves to play badminton and complains that she never has anyone to play with, consider forming a casual company league. Perks can help make your office a more fun place to work. Beyond all these employee benefits, JellyVision also told us that they reduce work anxiety for their employees by 1) hiring nice, funny, talented people who become the sort of colleagues who make the day more enjoyable and 2) by nurturing a culture of transparency, humor and kindness—a way of being that is modeled by their founder, Harry, and CEO, Amanda. Check out our list of corporate wellness ideas to give your wellness program some new life. Whether you’ve seen them in employee engagement films like Office Space, or experienced them yourself, cubicles are quickly dying out. Today, the most engaged companies opt for office decor and cool office supplies that promote comfort and collaboration, not seclusion. So cut out the cubicles and replace them with spacious, open desks. The possibilities for creating an open air office environment are endless, so be creative, and have fun with it! Coaching and mentoring shouldn’t stop after an employee’s initial on-boarding process. A study done by Deloitte in 2012 found that retention is 25% higher for employees who have engaged in company-sponsored mentorship. Some people in your organization will proactively seek mentors and training, while others will need it to come directly from their manager. Offer an optional weekly coaching session to discuss strategies and tactics that can help each member of the department improve in their role, and make them fun! Ask the managers of your organization to setup a weekly meeting to see where their direct reports need resources, any new ideas they have, and how things are going in their role. You’ll find that both managers and direct reports will look forward to these meetings and use them like a strategy session to improve their department on a weekly basis. Engage companies rely on open internal communications. An employee who feels cared for and is surrounded by people who bond with them is much more likely to feel happy and engaged at work. We all get to know our bosses and direct reports pretty well, but it’s also important for new team members to build relationships with the rest of the staff. UserVoice demonstrates this point well – they invite the whole staff to a game night whenever someone new joins the company. The company offers free beer, a game (think board games or pool/ping-pond/darts) and a “ridiculous sort of quiz” they invented. Your company has undoubtedly recorded its vision and goals for the year. Why not show employees exactly how their jobs advance the vision? This will boost each employee’s investment in the success of the company instead of just feeling like a cog in the wheel. Sit down with a list of a specific employee’s responsibilities. Create a flowchart that demonstrates how those duties ultimately lead to fulfilling the company vision. For example, if the responsibility is “managing Instagram” and your company vision is “changing the way the world purchases homes,” then highlight how Instagram engagement creates long-term brand recognition and has the potential to influence the way a younger generation purchases homes, especially when they’re ready to take the plunge in a few years. Ask your CEO for a quote that explains how the particular employee’s role contributes to the company vision. Have the quote printed in a postcard format. The employee can pin the postcard on the wall as a constant reminder and motivator. There are times when employees (especially the younger ones) are still figuring out their career paths. If a member of your team finds something else at your company that they’re passionate about and want to pursue, create a roadmap to get them there. This will help you retain some of your young talent when they might have otherwise abandoned ship. Working at a company that highly values morale has given me some interesting insight on how to engage employees. I’ve noticed that the times my coworkers are incredibly devoted to our work, where states of “flow” seem to be abundant, are when they are given real responsibility. This shouldn’t be confused with giving your team more things or tasks to do. I’m talking about giving them important projects and initiatives to take ownership of and knock out of the park. Humans are inherently goal-oriented, so when you give them something worth achieving, I believe you’ll be amazed at how much purpose and drive it gives them. If you’re a manager, give one of your direct reports an important project to be the lead on. On the flip side, ask your manager to take on a project that you think will help you grow and learn something new. Even if it’s something you have no experience doing – when you see your goal as being important to the success of the company you’ll find a way to get it done. And I promise you’ll feel more purpose from your work than ever. If you know your company culture and hire by it, you’ll continue onboarding employees who want to work with the person next to them. A positive corporate culture starts with the relationships between co-workers as well as collaborative dynamics in addition to consistent messages about values and the company mission. If you haven’t already, take some time to brainstorm your company’s cultural vision and even get it down in writing. Spend some time with co-workers and pinpoint the key attributes everyone seems to have in common. Once you’ve established a list of qualities, it will be easier to determine if an interviewee will fit into your culture. Keep the qualities specific to find the best fits. Almost anyone will be “nice” and “personable” during an interview, so it’s important to quickly go beyond the surface level with candidates in the hiring process. There’s a simple, three-word phrase to help you develop a deep understanding of the character and motivations of any candidate you’re interviewing – “and then what.” Constantly pushing an interviewee to provide more depth will help you quickly get to the root of his or her point of view, and help you determine if he or she possesses those attributes you identified as core to your culture. Show your commitment to community and social responsibility by giving your employees a couple of hours each month to get out of the office and participate in community service. Make your team members feel special on their birthdays, work anniversaries, their first day of work, etc. Or even better, make it completely random so it’s unexpected. This is one of the most significant employee engagement programs for upper management. Holding office hours is a great way to make yourself more approachable to the entire company. Allow people to come in for office hours to give feedback, talk concerns, and explore new ideas. An overbearing boss who is constantly micromanaging might just be the fastest way to create disengagement. Trust your employees to accomplish the work you give them without checking up on them 4 times a day. Plus, other insights suggest that trust doesn’t just inspire employees to do their jobs; it might actually encourage employees to go above and beyond their assignments. Trusted employees collaborate better together, and because they’re empowered, they might seek opportunities to take on even more responsibility. Find an inspirational quote or page from a book and send it out to your team on Monday mornings. 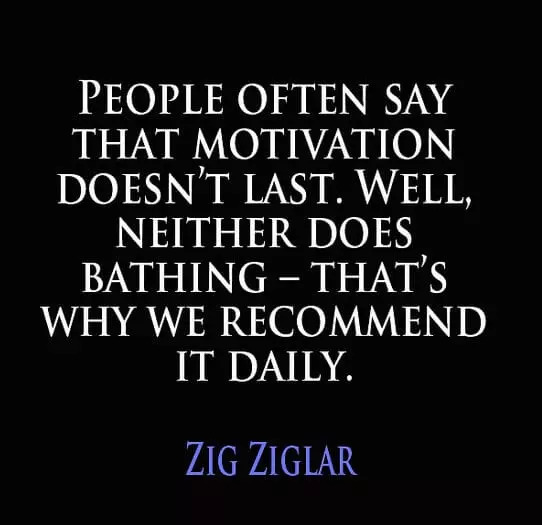 It’s a super easy way to get people motivated and inspired and a day that’s typically slow to start. Find out what your employees’ professional goals are and make sure they’re on a track to achieve those goals. Managers should sit down with their direct reports and plan the roadmap to get them to that next promotion or to acquire the skills they desire. Create some healthy competition and reward excellent performance with incentives for successful goal achievement. Tickets to a game, dinner for two or are inexpensive ideas that can help people feel more invested in their work. Pick a day of the week where one employee brings in treats to share with the team. Eventually, looking forward to food day will be a major bonding moment for the whole team. Not to mention some employees will even love the chance to show off their baking prowess. It’s Friday afternoon and your whole office is united by one thought: going home. Reinvigorate the team by taking song requests to blast over the PA system in the final hour of the workweek. Employees will love sharing their favorite songs to boost morale. If you’re a leader at your organization, your team probably get to hear you talk…a lot. Share your responsibilities and increase engagement by asking a different person lead your meetings every week. Get your employees more engaged in their work by asking them to think big. Start a learning club where employees select books or videos related to your work for everyone to enjoy. Pick a day where everyone piles into a conference room to discuss the item and its implications for your work. But instead of having the “head honchos” or even Human Resources send it, form a committee of employees who want to coordinate it. The volunteers will love the chance to share what they find important and the readers will love getting company news from their peers. Pick one day every month to ban emailing. If someone has a question, they’ll have to go talk to their coworkers in person. Even if they only talk for a few seconds, that face-to-face interaction with coworkers makes priceless employee engagement moments. If you send recaps of company progress to your employees, don’t just tell them your customers are happy, show them. 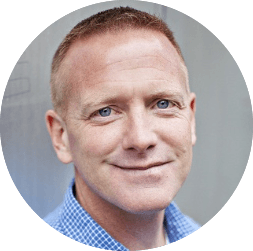 Add a glowing testimonial from your customer base, clients or nonprofit constituency to the email so your employees can see how their work impacts real people. Let’s say you survey your employees monthly to find out how they’re feeling. While some of their desires and wishes might be difficult to act on, send them updates explaining the progress you’ve made towards addressing their concerns, even if it’s just scheduling a meeting with your CEO. Not acting on employees’ valuable feedback will kill employee engagement. Dust off that old triangle chart we all know and love from Psychology 101, because Maslow’s hierarchy might have implications for employee engagement. Beyond the salary and the benefits, employees want to know that their work matters. Try working the implications of their efforts into annual reviews instead of just focusing on their performance. 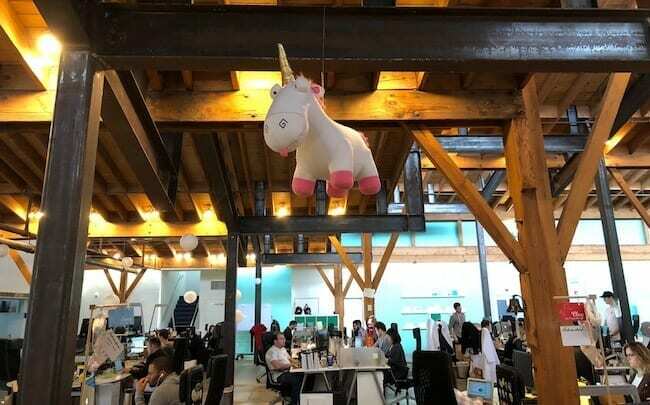 While it’s wonderful they completed a special project on time and within budget, go a step further and explain the project’s greater impact on the company. Glassdoor offers a raw source of employee feedback that might be incredibly valuable if you’re brave enough to dig into it. Even if the comments seem negative, they could give you insight into how your employees really feel. As you sort through comments, revealing patterns should emerge to spotlight areas of employee relations you need to improve. Send out an Excel sheet with a list of positions in your company or department and have employees vote for a position they would like to do for a day. Let the person currently in that position give them a day of training before they launch into their day on the job. 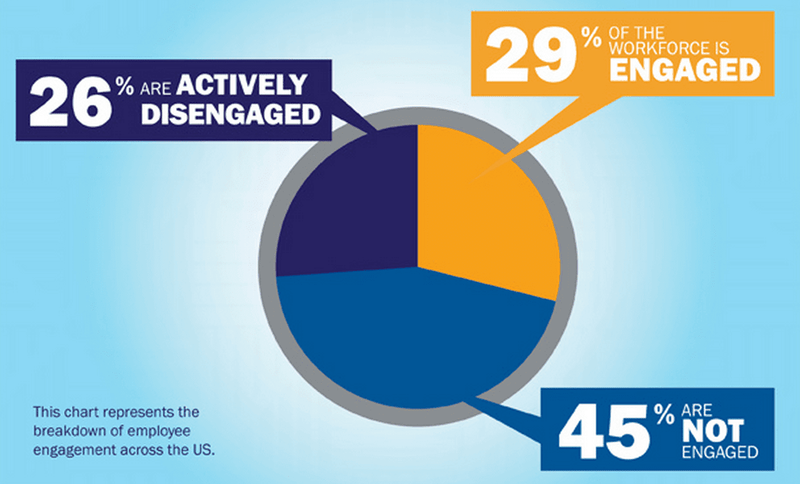 With research showing a large chunk of the workforce does not feel engaged at work (see the featured image at the top of this post), the availability of employee engagement tools and services has skyrocketed. For you, that means you can find help if you’re completely lost. For example, some companies have brought in something called a corporate anthropologist who will study your company and your employees with the end goal of improving the overall business. Some people invest more in the games they play after work than they do in their actual work…the work that pays the bills. Why is that? Games leverage instant feedback and compelling goals to keep players coming back for more. 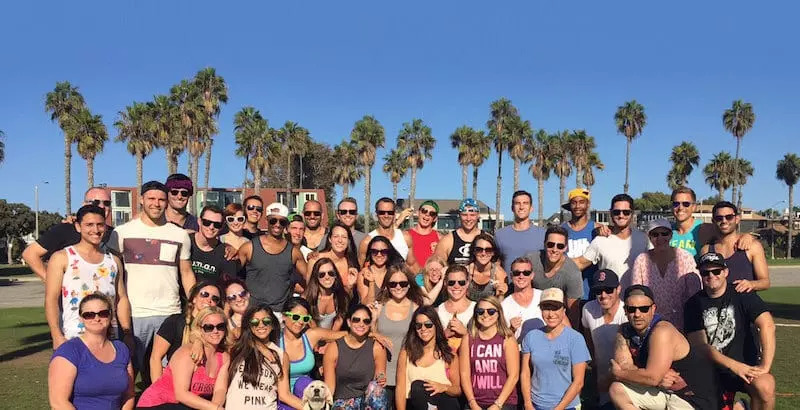 Now, companies like Bunchball hope to bring these elements into workplaces to engage employees in ways that go beyond a regular paycheck and benefits. Ask your employees which tasks they hate above all others. Sometimes, even one dreaded task might create the feeling of on-the-job misery. Look at the list carefully and consider how you can juggle some responsibilities to make everyone happier. One employee’s most hated task could be another’s favorite. This post from the Talent Space Blog says the first step in any employee engagement initiative is to stop. This stop gives you time to consider why you’re starting the initiative in the first place and to think about barriers to success. 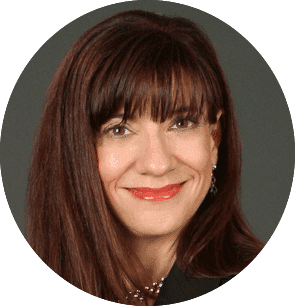 Condense your reason for starting the initiative into a mission statement that you can use to guide you through every move, so you don’t get bogged down with unnecessary initiatives. The Disney Institute believes consistently demonstrating genuine care makes employees feel happy and engaged. You can demonstrate genuine care in endless ways. One of the institute’s ideas involves finding out what’s bugging your team. Maybe they hate their office chair or would love to have some upbeat music playing while they work. In this case, it’s the little things that go a long way in showing you care. Throw away that meeting rule book and schedule meetings without agendas or target outcomes. Have completely open brainstorm meetings where you throw away limitations and volley around some big ideas. Guide the discussion by throwing out an area of your business you would like to improve. Keep these brainstorms positive by creating a few ground rules. Ask employees to keep their minds open and to avoid shutting down others’ ideas with mocking laughter, negative automatic responses, and skeptical questions that could block the flow of ideas. Remind them to focus not on the how, but the what and why. Why is it so important to keep the brainstorms open? According to LinkedIn’s Inside the Mind of Today’s Candidate report, 51% of employees say “having opportunities to freely express themselves” makes them feel a sense of belonging at work. Everyone takes a different approach to problem-solving. Schedule meetings where you reveal a big problem facing the company with complete transparency. Let employees take a crack at explaining how they would solve it. Employees will feel more engaged in company outcomes and they might just solve a few problems while they’re at it. Who has a better handle on the events your employees will love than your employees themselves? Instead of trying to think of company outings that your whole team will love, get your team involved in the planning process. Ask for event ideas and seek out volunteers who want to coordinate regular outings. While it might seem superficial at first glance, giving your employees a chance to be more invested in what they look at everyday could do wonders for engagement. Start an employee design committee to let your employees take some ownership in the place they work. Plus, the personal touches will make the office feel like home. If you’re struggling to come up with good employee engagement activities, it might be time to take a step back. The word “employee engagement” alone doesn’t give you anything you can visualize. 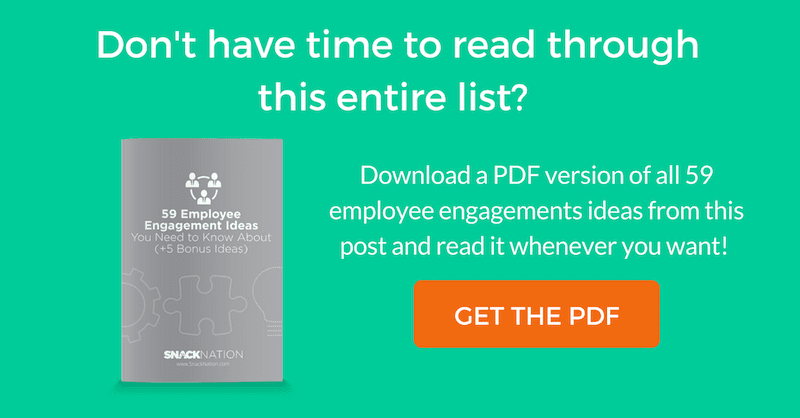 Try considering what it means for your own employees to be engaged specifically. Once you figure out what employee engagement looks like in your company, you can set your sights on achieving it. Engaged employees always ask what else they can do to improve the company. Engaged employees ask questions during meetings and show up to work on time every day. Engaged employees meet their deadlines. Engaged employees frequently share exciting new ideas with their bosses. Engaged employees request opportunities for personal development. Engage your employees with a quick bonding event at the beginning of your weekly meetings. Pick one employee and tape a “hot seat” sign to their chair. For the first minute of the meeting, other employees will shout out their favorite things about the person in the hot seat. Your employees probably have tons of ideas that could help the company. However, they might not have anywhere to share them. Have a quarterly show and tell where employees can present tools, information and ideas they believe might do the company good. Organize employees from different departments into teams to tackle long-term projects that involve responsibilities outside of their typical scope of work. Not only will they get to know people they don’t work with on a day-to-day basis, they’ll pick up skills from one another as they work on important projects. It’s not just company policies that make people disengaged at work. It might also be close-minded coworkers that shut down their ideas. Set an expectation that your employees follow a “yes and…” mindset. This simply means creating a culture where everyone’s ideas are met with open minds, and not negativity. Your employees might seem distracted or disengaged, but maybe it has nothing to do with work. Let’s say Karen’s daughter has a piano recital every Wednesday at 4 PM and she’s distant at that time, wishing she could be there. Find out what outside events might be keeping your employees distracted and work with them to adjust their schedules to accommodate their busy lives. When you send an employee work with changes or request a re-do, make sure those requests come along with a detailed explanation. Employees who always see their worked rejected or marked up will become frustrated and disengaged. Explaining the changes helps them understand your thought process and increases their desire to improve. 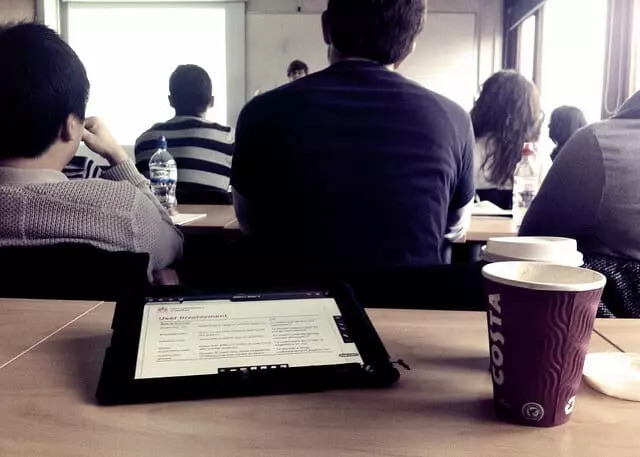 The internet is exploding with a selection of free, open source courses from major universities. Many of your employees would probably love to take one, but simply don’t have the free time. Come up with a points system in your office that offers employees incentives for taking work-related courses. Maybe they get bonus points if they give a presentation on what they learned. There will be times when your team feels like they can’t possibly focus. Show them that you understand (and have a sense of humor about it) by creating a “distracted jar.” Fill it with activities, jokes and even things to Google when they feel like they can’t work for another minute. Help them get the distractions out of their system so they can continue on with an engaged workday. A vent box is the evil twin of the suggestion box. Encourage employees to fill the box with their complaints, but be sure to keep anonymity sacred. Your employees’ deepest frustrations might also be excellent opportunities for learning. 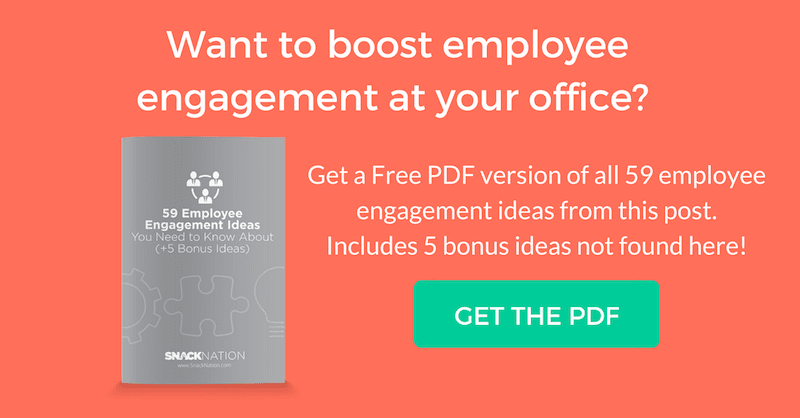 Want even more ideas to improve employee engagement? Here are 11 bonus ideas! This has been one of the best ideas we’ve implemented at SnackNation to make sure we stay on top of doing fun things together as a company. Culture Committee is comprised of individuals from each department who act as ambassadors. These ambassadors model our core values, and ensure the culture is steadily moving in the right direction. Whether Communication/Hype, Events, Wellness, Philanthropy, and day to day celebrations we have a sub committee dedicated to setting up and executing events, all while tackling our ultimate goal of breaking silos between departments. Making our office more like a home. We strive to create the “weather” of the company. Bringing the sunshine even when/if someone feels like they are in a thunderstorm of stress. At SnackNation, we take new hire intros very seriously. Create a goal setting system that gives team members the opportunity to set their own goals. People are more likely to be motivated by a project or goal that they set for themselves, versus one that was set for them by their manager. Managers should then work with their direct reports to refine that list into goals/projects that align with the department’s (and company’s) goals. Depending on your organization, this could be monthly, bi-monthly, quarterly, bi-annually, or annually. Once goals have been set, employees break those bigger goals into smaller ones each week. We use a system called Crucial Results to do just that. Here’s how it works. Is there an industry conference that someone on your team would love to attend? Perhaps your HR professional would love to go to one of the top HR conferences. Or maybe an online course that they’ve been dying to get their hands on? Maybe your marketing team would love to learn email marketing from the newest and hottest course. Invest in your team’s growth is one of the best you can make as a manager. It’s a win-win because they get to improve on a skill, and in turn, they help your organization improve. When was the last time you got a hand-written note? With a world that is constantly wrapped up in digital communication, doing something “old school” like a hand-written note stands out to people. Bonus points for cards written by someone like the CEO or President. What mascot best represents your team? We break bread with each other to bond. To share stories, relate to one another, and pass the salad. Break bread as a team and watch the relationships blossom. Like team lunches, taking a walk together gives your team the chance to take a rejuvenating break from work while connecting with their colleagues. And in case you hadn’t heard, people with a best friend at work are 7x more likely to engage fully in their work. Monthly Q&A has been another hit at SnackNation HQ. Our CEO (Sean Kelly) and President (Ryan Schneider) take 1 company all-hands meeting each month and use it to field any questions people have about the company. Our team can submit questions via an anonymous Google form, or they can ask live during the 30-minute Q&A. We really value these Q&A’s because it gives our leaders the opportunity to be fully transparent with the team. This is another SnackNation favorite. Once or twice a month, we let a member of the SN team host a lunch and learn on any subject they’re passionate about. Prior topics have been wide ranging – from personal finance to cryptocurrencies to persuasion. 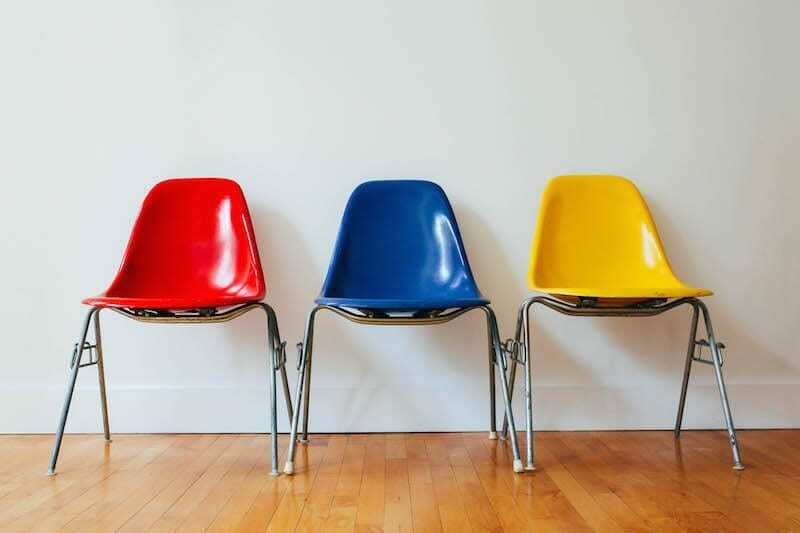 In addition to exposing employees to people, they may not have worked with before, playing “musical chairs” also keeps employees engaged and excited for work simply by introducing change. By shaking things up, you just might give employees the shake-up they need to think of a new idea or solve a problem they’ve been chipping at for months. When you focus more attention on engaging employees, the results are higher productivity, better retention rates and improvements in organizational success across the board. Now it’s your turn to take these simple ideas and put them into practice at your office. What activities has your company used to increase employee engagement? Let us know in the comments below. Emil Shour is the Content Manager at SnackNation. His goal? To help companies create better places to work by improving health, inspiring teams to improve together, and making the office a fun and productive environment. These are excellent ideas… hot seat is simple yet could be the greatest motivator for the day. could impact an employee in more ways than we expect. brilliant!!! I agree with you Elizabeth these points mentioned are really motivational tips for every employee and must be followed in every organization. Thank you, Elizabeth, glad you enjoyed it. Wonderful ideas! Work isn’t just a place to show up to anymore. It takes a lot to keep employees. Hi Kathy, you’re 100% right. We spend a majority of our waking hours at work so it needs to be a place where we actually want to be. Great article! Loved all the ideas and plan to incorporate some! Hi Lauren, glad you found our list of ideas useful! Good stuff! I really liked the ideas about satisfaction surveys. Hannah, glad you liked the list! Satisfaction surveys are an important part of any company focused on increasing engagement. Great article. I plan to use some of these ideas. Keep them coming. Enjoyed this article and the focus on positive, encouraging and healthy paths onward & upward – thanks for sharing these ideas! Great article with really good suggestions. I believe the key to good employees are making sure they are happy…it takes very little to make them happy so why not do it? Happy employees are definitely more engaged and care about their work. What are some ways your company boosts employee happiness? Hey Emil, you have done a superb job here in collating these ideas. Most of the times when we read such posts they are just some ideas which will work for select group of people but all the ideas that you have mentioned here are doable and does not involve a lot of cost. I feel that the employees will feel good if we can give them two basic things often – appreciation for the work they do and a deep bond / connect with their Immediate Bosses. I also appreciate the fact that you have replied to everyone who has written to you! Keep up the good work. Thank you for the kind words! You hit on 2 solid points – finding value in your work and having a good relationship with your manager are vital for engagement. Thank you for sharing your great insights. I would like to reinforce number 7! One of the biggest growth pains within companies is the lack of recognition and the decrease in celebrating daily victories due to the great focus on work. There are a lot of tools to use when it comes to employee public recognition: Tap My Back is a very straightforward app and focus only on public recognition and praise. Hi Guilherme, thanks for the heads up about Tap My Back. Looks like a really cool and valuable tool! Really interesting…I’ll have to try some of these out. We have adopted and implemented The Leader In Me and the 7 Habits of Happy Kids here at our school. http://www.theleaderinme.org/the-7-habits-for-kids I am so happy that I have added Snack Nation to our efforts to “Sharpen the Saw”! I will gladly share several of these great engagement ideas with my staff! Hi! Do you have any ideas that I could use for a meeting? 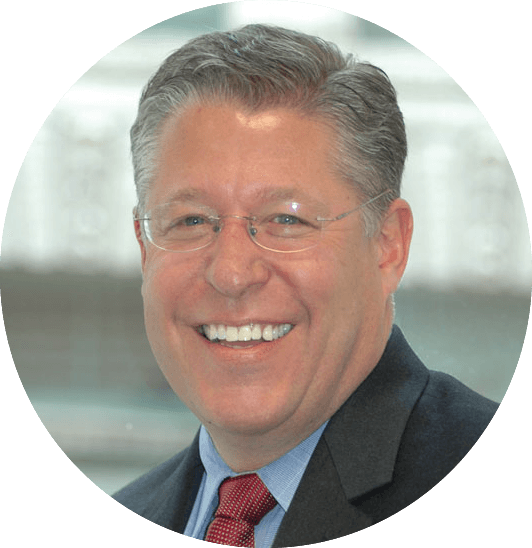 I am a CEO of a hospital and want to engage doctors, nurses, and non clinical staff members simultaneously. Hi Cindy, there are a lot of ideas mentioned here that work well for meetings too. One idea that stands out to me for your particular situation would be to instill a sense of “team”. When people feel like they’re part of something bigger than themselves and that they’re in it together, engagement usually follows suit. My girlfriend is an RN and one of the things that makes her less engaged at work is when her manager is inaccessible or people on her floor are not willing to help each other out. As CEO, you should ask managers to be there for their teams. Something like our “Office Hours” idea mentioned above (#25) is a good start. Good suggestions! I’ve been frustrated with the lack of involvement lately and discouraged to try again. I think engagement is too important to not try again. One idea may be to create a “committee” of volunteers. A committee can help you get input from several different departments, which should increase the likelihood of adoption from the rest of your company. Connect with people’s “why”. If you know what motivates them and what their passions are, engagement becomes a lot easier. Today I advance in my position. Part of my advancement meant I had to take on the role of employee engagement. It comes with a great benefit, and I’m excited to start working on it this article gave !e a great idea of where to start. I also what to thank you Emil for what you are sharing. I don’t think I will have a problem at hitting the ground running. I think the vent box is one of the first ideas I will use. That will help me to understand alot about my co workers. Hi Andreena, congrats on the promotion! I think the vent box is a great idea to start out with. It should definitely give you some good insight as to what people are thinking, but may not be voicing around the office. Good one bro!! keep us posted, worth to read & implement. Thanks so much for these – been beating my head against the wall trying to get engagement programs rolled out with upper management. Will present a bunch of these ideas, I’m confident at least a few will stick! Hi Maria, that’s awesome to hear! Let us know which ones you use at your office and how effective they were. Great post! Do you have more info on this “distracted” jar idea? Is there another article you could link me to that goes into detail? Thank you!! I really care about my Employees and just want to see them always smiling!! Your ideas have really helped me a lot!! Thanks Barada. Listening to your team is vital when it comes to employee engagement. You can’t force things on people and you have to be willing to listen to what’s important to them. Very precise but useful for day today HR Management for better commitment of the employees. Thank you for good post and all the details. I can’t not even imagine how much you put the effort on this article. In my opinion, making a meeting checklist is also really good for preparing. Since then I’ve been a checklist addict so thank you to the OFFSITE, and I’ll plan to use some of these idas. Thanks again! I just started a new job recently, and they do a lot of things to keep us employees engaged. I thought that it was a cool that you mentioned to do a show and tell meeting to get input from the employees! I also really like the idea of letting someone experience another job in the company. Great list! Thanks Wade, I appreciate the feedback. You’ll notice that a lot of the ideas mentioned on this list revolve around communication. Being heard and feeling like your opinion is taken to account is by far the #1 thing that leads to engaged employees (from my experience). Great post, Now a days every business needs this solution which topic mentioned in this blog. Employee engagement ideas is a key factor for every business. There is one of the best ideas for employee engagement. So, this is one of the best posts I’ll ever read for employee engagement..!! Hi Emil Shour, your ideas are awsumm but the problem is .If the employees only are not enthusiatic in all these tasks then being an H.R what should I do ? Hi Komal, if your team is not enthusiastic about any of these ideas, you should ask them what they want. 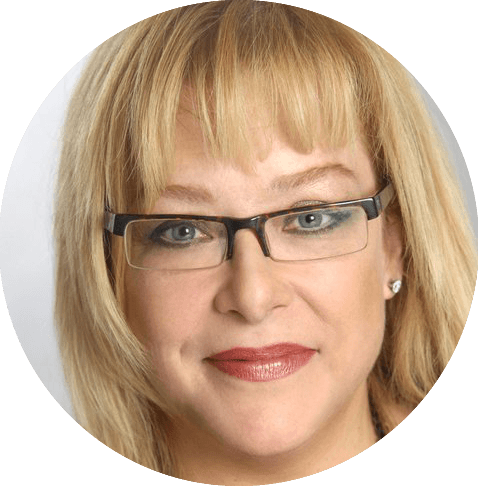 You might find some surprising answers..
Great article, love that you shared so many ideas, since finding the right fit and combination of offerings is different for each company. Nothing is a one size fits all approach anymore. Agree 100%, Morgan. Every company culture is different, therefore the way you go about employee engagement needs to be different. That blog was amazing, I am very much impressed with your thoughts. I got the best information from this site of the blog, It’s very useful to all and us. Thanks for sharing this post. Regarding point 14. Ditch the Cubicles, we moved to an open office, it has hurt morale and productivity, some people cannot focus, some have to deal with noisy co-workers, introverts are not able to focus, no noise or visual privacy, there are many studies that show that open office does not foster collaboration at all and instead impact productivity. I agree – I don’t think open office is for every office, but it’s worth experimenting with. Does your office have designated quite spaces for those people who prefer to work where it’s quiet? That’s been the key for our office. We are open office design, but we have several rooms and areas that allow people to work in a quiet space if that’s what they prefer. I was recently tasked with training new hires (who are my peers) in an ultra busy, understaffed department and without having any training tools or personal experience as a trainer. Needless to say it has not always been a positive experience for our new hires or for myself. I am in an ongoing process of educating myself in he training process and developing a training curriculum that both teaches and motivates our new employees. Fortunately there are many excellent ideas and resources online and I want you to know how inspirational these ideas are and how they provide information that goes beyond just teaching the tasks of the job. Thank you. Wow Emil, your suggestions are great and the fact that you take the time to acknowledge each blog is inspiring. Keep up the good work. Hey Arun, thank you for the kinds words. I had heard that quote too and found out it was from Stephen R. Covey. If you haven’t his book “The 7 Habits of Highly Effective People”, I highly recommend it! Awesome tips you have here! I think most of us would agree that fun and jokes at the workplace helps reducing stress and the risk of burn-outs. During these relaxed moments, we recharge our batteries and take a break from our every day work routine. Thank you for this helpful advice! Unfortunately I have a habit of putting everything into the important and urgent category. Your list will help me stop and think about what I’m doing and how to prioritize it. Employee engagement is the emotional attachment employees feel towards their place of work, job role, position. HR managers can agree that employee engagement and retention are at the top of their priority list. Supporting local charities is a great way to inspire your employees and can also be a great idea for a team event. Employee surveys can be a great way to find out how your employees really feel. Wow, thanks so much for this article. You have a lot of great ideas and backed them up with examples. I will be sharing these with the Supervisors in my organization. Thanks, Dawn! Ideas are only as good as they action they inspire – so here’s to some of these ideas becoming plans of action! Great article Emil, quite a long list you got there! Thank you, Wesley, glad you found it valuable! Wonderful site. A lot of helpful information here. That is really nice way, Thank you, Wesley, delighted you set up it costly! this is very interesting and informative. This is going to help me in a great way! Excellent Article Emil. Loved it! Thanks Emil! Great information for my team! I have been given the assignment to lead our Employee Engagement team site-wide. I stumbled across your article and there is definitely a lot of value to your thoughts. I hope we can implement some of them, if not most of them at some level. Thank you for taking the time to put this together, clearly it has been beneficial for quite a few people for some time now. I would also like to suggest escape rooms as an addition to your brilliant list. They provide great opportunities for team interaction and breaking ice with new employees. The thrill of solving puzzles and problems, out of the office environment, where there are no hidden agendas or office politics, can do wonders for a team. Try it out! Valuable post. Better engagement means better productivity for obvious reasons. Engagement boosts positivity, which in turn increases employee retention. Engaged employees tend to feel more satisfied and are less likely to quit than disengaged ones. Thank you for such a post. Really helpful for our company. You have a lot of great ideas and backed them up with examples. Many of these are truly excellent suggestions. But be aware that the people who have to work in them every day generally HAAAAAAATE open offices. Yes, in an ideal world you can collaborate, but in the real world, the benefits of collaboration do not make up for the irritation of the complete lack of privacy or personal space. This goes double if a few top brass have private spaces (so they don’t see or experience the problems), and all of the little people are relegated to the open spaces. I think that’s a really interesting point. 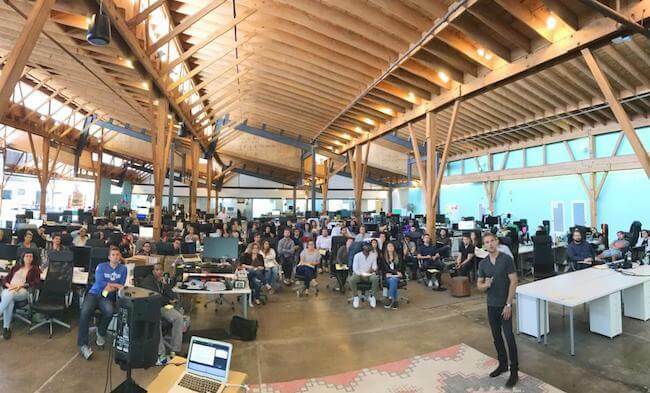 What if everyone – including the CEO – sat in the open space? Would that change your opinion? I agree with Jen. Open office spaces do not increase collaboration and it doesn’t take the needs of the introverts or attention deficit employees into consideration. I think great collaboration spaces should be created but provide those who need cubes for focus and privacy that option. Regardless of whether or not the leadership has offices, this is not a great environment to work in on a day to day basis. it seems like a great idea on the surface, but many of those who have worked in this environment are not happier or more engaged. They are distracted and frustrated. This post is really great! So many good ideas. Hi Emil! It is a very well thought out blog – Kudos to you and your team – great effort! I represent a Company called UniMity Solutions and we have built an app called Unifi. Would love for you and your team to take a look at it, and give us your take! 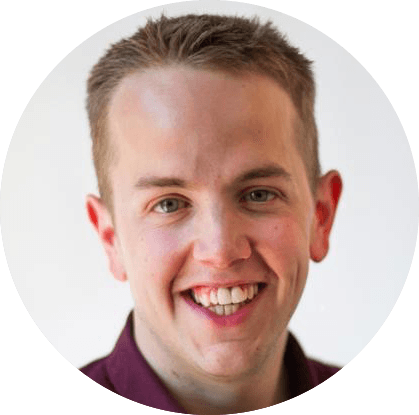 Normally Engagement Apps are transactional – and we have deliberately not done that. We have taken our experience of managing one of the most popular league teams in India, and have pooled that into this app. Please do connect with us…excited to share the app with you! Thanks for sharing these excellent ideas. I have got a lot of new things from your ideas. This post is very simple to read and appreciate without leaving any details out. Great work! Glad to hear it, Puneet! Don’t worry, more posts are on the way! I think any thing that we do as a team outside office hours, directly impact the way we work as a team in office. I genuinely acknowledge the kind of topics you shared here. Thanks for posting us a great detail that is actually helpful for us. I work in a unit where we literaly have to come with fun employee engaging activities and concepts, boy, it is tough!! but ur ideas are kool, a lot of which is currently in place in my organization. have u taken time to study the African work force? Could you please suggest a employee engagement activity for mediocre work (like jewelry retail shop)? Hi Suuhashini! The beauty of most of these employee engagement ideas is that they can be practiced across any industry. I’d suggest picking a few of your favorites and practicing them with your team. Even reminding your team of your company’s purpose or praising their good work on a regular basis can turn ‘mediocre’ work into a purposeful, fulfilling experience! Awesome and much useful information. Nice and detailed explanation. Ultimately, after spending many hours on the internet at last we’ve uncovered somebody that surely does know what they are. Thank you for sharing a wonderful article. Great post. I will be your regular visitor.